Man Utd face West Ham United on Saturday evening with Ole Gunnar Solskjaer hoping to see his side put a poor run of form behind them. The Red Devils have lost four of their five games in all competitions, which in turn has seen them crash out of the FA Cup, fall behind in their Champions League tie with Barcelona and drop out of the top four in the Premier League. In turn, they can ill-afford another slip up this weekend, and will be hoping to avenge their defeat to the Hammers earlier in the season while Jose Mourinho was still in charge. 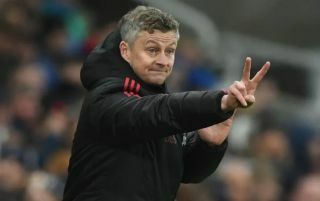 Solskjaer has also got to consider the second leg of their quarter-final tie with Barcelona on Tuesday night, but he has been forced into changes too. Luke Shaw and Ashley Young miss out as they serve suspensions, and so Diogo Dalot and Marcos Rojo start in their place, with the former shifting back from a more advanced role against Wolves in the last Premier League game, while Phil Jones returns to the line-up. Elsewhere, Juan Mata starts in another change from the side that faced Wolves, while Marcus Rashford drops to the bench, perhaps as part of a rotation plan from Solskjaer to have him ready to face Barcelona having struggled recently with an injury. Anthony Martial gets the nod with Victor Lindelof and Scott McTominay also dropping to the bench, with Solskjaer opting to tweak his formation. This is a crucial game for Man Utd, as a win would temporarily move them to within two points of the top four, with Chelsea to play Liverpool on Sunday. With such a gap to fourth place though, they simply can’t afford to drop any more points between now and the end of the season, regardless of whether they must also consider the trip to the Nou Camp next week.
? Introducing #MUFC's starting XI for #MUNWHU!